The municipality of Yeşilyurt (304,369 inhabitants in 2016) is located 20 km south-west of Malatya. The flag of Yeşilyurt (photo) is white with the municipality's emblem. "Belediyesi" means "Municipality". The motto reads "For All of Us...". The emblem, designed by Deniz Taç, was unveiled in January 2015, after a selection among 1,083 proposals. The emblem uses the municipal colors. Green stands for the natural environment, blue stands for water, and orange, the color of apricot, stands for Malatya. The emblem is shaped like letter "Y", for "Yeşilyurt". In the upper part, the five blue sectors refers to the sky and abundant freshwater, highlighting the town's livable geography and climate. Together with the two orange sectors, the five blue sectors represent the seven municipalities forming the district (Yeşilyurt, Gündüzbey, Bostanbaşı, Yakınca, Dilek, Topsöğüt and Şahnahan). The two green sectors forming the base of the "Y" hug the other sectors like parents; one sector represents the Special Province Administration while the other represent the 36 districts connected to Malatya's central district. Organized from 1 October to 5 December 2014, the contest yielded 1,083 proposals submitted by 537 participants. Three designs were selected by a jury for submission to public vote. The emblem eventually adopted by the municipality slightly differs from the submitted design. The light blue sectors were made orange, while the municipality's name was relocated right of the graphical element instead of beneath it. The foundation's year of the municipality was added at the top of the blue sectors. 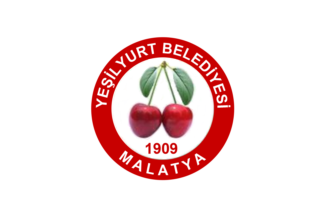 The former flag of Yeşilyurt was white with the municipality's former emblem, featuring two cherries. Yeşilyurt is especially famous for its cherries and celebrates the cherry festival every June.